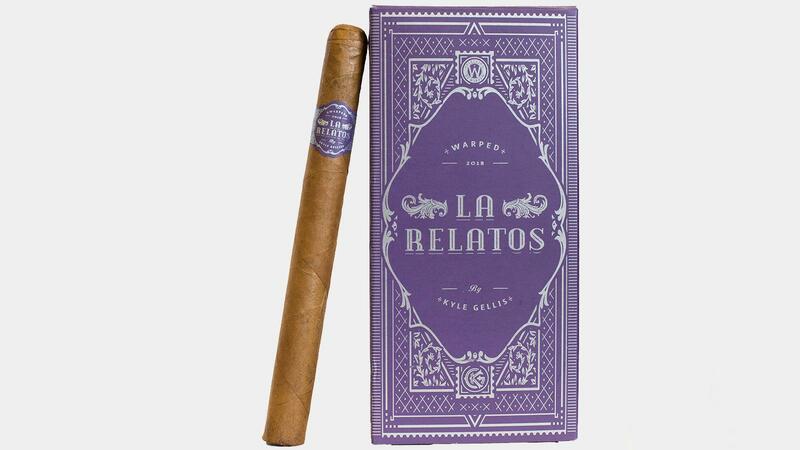 Fans of Warped Cigars now have the opportunity to smoke one of the company’s first blends as the reincarnated La Relatos is now available in cigar stores. La Relatos, which loosely translates to “the stories” in Spanish, debuted earlier this year at the annual IPCPR trade show and, according to owner Kyle Gellis, is said to be one of Warped’s original blends. The new smoke comes in one size only, a 6 inch by 38 ring gauge panetela that Gellis is calling The First. It’s covered in a golden-brown Ecuador Habano wrapper and the binder and filler are both Nicaraguan, with the filler a mix of Corojo ‘99 and Criollo ‘98 tobaccos. The First comes in five-packs and carries a suggested retail price of $9.30 per cigar, or $46.50 per pack. La Relatos was rolled at Tabacos Valle de Jalapa S.A. (TABSA), a factory owned by Eduardo Fernández in Estelí, Nicaragua. Gellis plans to add more sizes to La Relatos in the future—not on an annual basis, but every other year. Gellis created Warped in 2008. The brand is known for cigars such as Futuro and Guardian of the Farm, a brand that was named the No. 8 cigar of 2017. A new shipment of Flying Pigs—unique, stout perfectos with pigtail caps that span the Drew Estate brand portfolio—is on its way to cigar shops across the United States. San Lotano Dominicano, a collaboration between A.J. Fernandez and José “Jochy” Blanco, is finally coming to market. “Game of Thrones” is back, and we took the liberty of pairing some of our favorite characters with a cigar that they would likely enjoy.